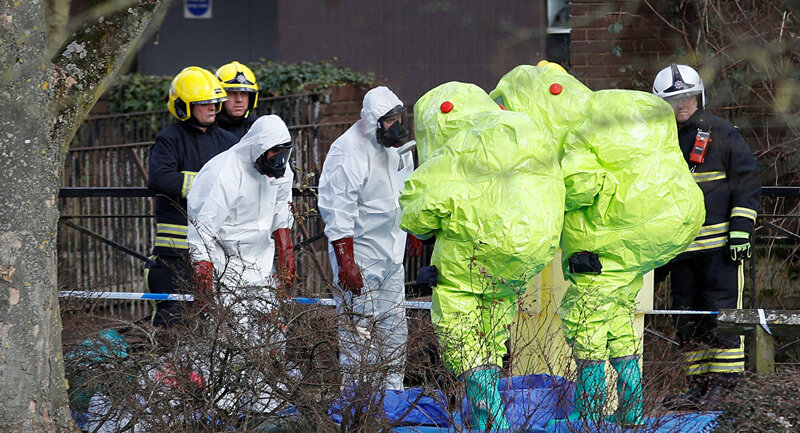 Sputnik spoke with former Kremlin adviser Alexander Nekrassov to get insight into Sergei Skripal's poisoning in Salisbury and to clarify the immediate response of British authorities, who appear to be ignoring the simple fact that the Porton Down chemical lab near where the incident happened stores samples of the nerve agent Novichok. Sputnik: It seems like Theresa May rushed to throw down the gauntlet, in asking Moscow to explain the poisoning of Sergei Skripal, especially after the investigation is not complete…what affect does this have on an already volatile relationship between the UK and Russia? Alexander Nekrassov: First of all it is very odd that the British authorities haven’t given the police and authorities evidence from their investigation. It’s important to note that investigations into chemical weapon use usually take at least a month. It was very strange to hear Theresa May coming into the commons accusing Russia and using ultimatum language such as ‘you will explain yourselves to us on the deadline on this day. If not you’re guilty’. I’m sorry this not language does not work in a modern diplomacy – this is not even civil. The Russian government will obviously not reply and why should it. It’s not a matter for the Russian government to be concerned about. The British authorities have a situation on their territory; they are obliged to investigate it, produce some sort of proof and then come out with this proof. What we’re seeing now is a farce and especially a farce concerning the media, which is out of control in Britain. Sputnik: Lavrov has stated that the UK should abide by the Convention on the Prohibition of Chemical Weapons and provide Russia with access to the samples of the nerve-agent which was allegedly used to poison Sergei Skripal and his daughter… will Lavrov's words of reason resonate with Theresa May? Alexander Nekrassov: I think Lavrov had a fair point to make that the British government, if it’s already making allegations, should provide proof that this chemical was Russian made. That’s the first point, the second point is that the British government is saying that because the nerve agent is made in Russia and therefore Russia is behind the incident. I’m sorry but every laboratory in the West including Porton Down which is only 7 miles away from Salisbury, has a sample of this so called ‘Novichok’, Newcomer, as they called it. They use these samples to produce the antidotes, so why isn’t this Porton Down facility being investigated? Why aren’t the people who work there being investigated and asked if they have lost a sample of this weapons grade chemical? This is very bizarre for the British government to come up with this ultimate without a single ounce of proof saying its highly like, and I must stress ‘highly likely’ that Russia is behind this… I’m sorry this is childish. This isn’t propaganda is some petty bitterness I would say. Sputnik: Is there a likely explanation for this attack which isn’t just simply pointing fingers at Russia without any solid evidence? Alexander Nekrassov: There are so many options. In a civilised manner the police and the intelligence services should have said they were looking at different options. That is the civilised way. There are rouge agents of a different nation that have gotten access to this particular nerve agent and used it for some sort agenda such as slander and tarnish Russia or cause friction between Britain and Russia. The views and opinions expressed by Alexander Nekrassov are those of the speaker and do not necessarily reflect those of Sputnik.